This 1 to 1 coaching service is perfect for those speaking at a conference or event. Alternatively, those involved in politics or senior management can also benefit greatly from this one to one training. Due to the confidential nature of our 1 to 1 coaching service, testimonials have been kept anonymous unless client has specifically volunteered their name. "Barbara is a superb public speaking coach and recently assisted me in developing and delivering a speech to 300+ conference delegates. Barbara's practical, down to earth, no nonsense approach is exactly what I was looking for! I'd recommend Barbara's services without hesitation." "As a professional speaker I am constantly upping my game - Barbara coaches me to do this on an on-going basis." "Just to let you know that my speech went down very well last night. Many people said that it was the best speech on the night. Many thanks for all your help and I will have no hesitation in recommending you to others looking for guidance in making speeches." "Barbara is one of those experts who knows how to deliver messages in a professional way. I liked the honest overview of my own capabilities and detail on how to make improvements. I left the training with a positive mental attitude and was glad to have attended." "Barbara recently coached me in advance of a presentation I had to give as part of an interview process for a very senior role. Barbara's training made a huge difference to both my confidence and approach. Over a few hours she transformed a dull presenter into a winning presenter without changing any of the presentation content. Her techniques are practical and resulted in a marked improvement in my performance. I succeeded in getting the job entirely built on the impact of presentation I gave. I have 100% confidence in recommending Barbara." "The coach was very professional, the feedback was very quick & direct. I improved my business presentation content & delivery rapidly on the 2 & 1/2 hour session, over the following week I was able to put all the suggestions into my final draft & delivery at the conference. I will certainly work with On Your Feet again." "A really fantastic training session and I still use all of the pointers and have completely relaxed. No longer sound like I am a monotone news presenter!!! Thanks again." 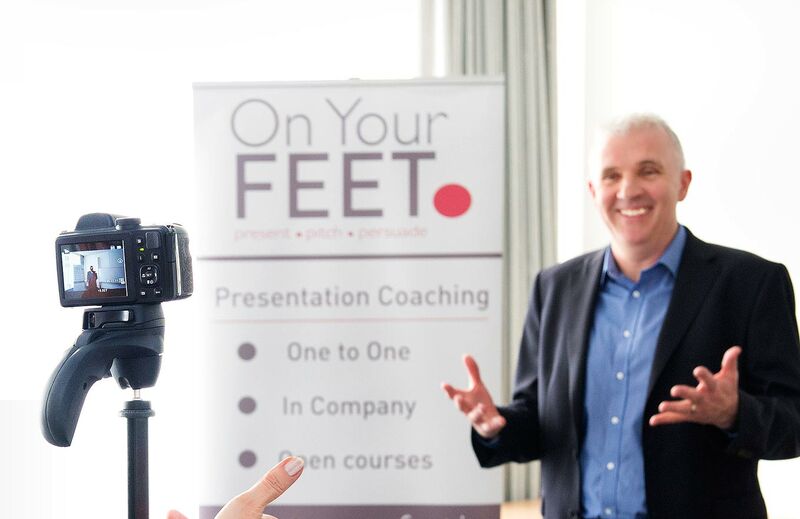 "The One to one at On Your Feet was excellent. I learned more in an hour or two than most would get in a week's course." "I think I SMASHED IT! Thanks to you. I was amazed at how much we covered in a few hours on the 1 to 1 session. My presentation was a triumph!" "Your help was invaluable in changing it from a talk that you survive, to leaving the group with emotions that they had to deal with... I was delighted." "Your advice was invaluable, I feel like the two hours with you moved me on miles in my public speaking ability."